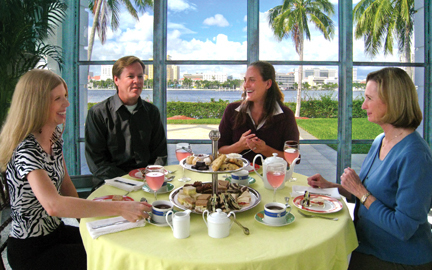 Treat Mom to an exclusive Mother’s Day celebration that she will long remember – a truly elegant tea service at the glorious Flagler Museum, a National Historic Landmark treasure of America’s Gilded Age. The 75 room estate museum known as Whitehall is nestled between the Atlantic Ocean and Florida’s Intracoastal Waterway in sunny Palm Beach. The stately home was built by renowned industrialist and developer, Henry Flagler, as a winter retreat for his lovely wife. The home, a distinguished example of Beaux Arts architecture which was extremely popular during that period, is recognized as one of the most magnificent private dwellings in the world. 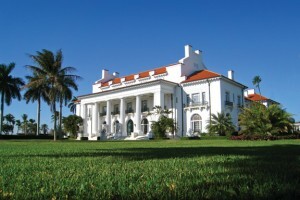 The Flagler Museum is open year round. The museum’s Flagler Kenan Pavilion Cafe, which normally closes down for the summer months after Easter, will host the Mother’s Day festivities for the weekend with special hours. Mom will delight in a lunch menu of classic tea sandwiches, scones, sweets and the museum’s special blend of tea – all served on the exquisite Whitehall Collection of fine china. Each mother will also receive a colorful corsage, a keepsake photograph and a $10 gift card to the museum store. It is without a doubt, every Mom will be impressed by her son’s or daughter’s refined taste and appreciation of arts, culture and history with this unique gift. This special outing will tower above the box of chocolates, the flowers and the greeting card – it will touch her heart and leave a lasting impression – a beautiful family memory for all to share for years to come! Saturday, May 7th. 11:30 a.m. to 2:30 p.m.
Sunday, May 8th. 12 noon to 3 p.m.
Special Note: Tickets to the Tea INCLUDE all taxes and gratuity, full admission to the museum, as well as optional docent-led tour, self-guide brochure or audio tour handset. Why not extend the celebration with a weekend escape! There is so much to see and do – world-class shopping, dining, boating, beach activities, theater and more! Drive 30 minutes south of the hustle and bustle of Palm Beach, and you are in the lovely seaside town of Delray Beach. Check out the beautiful SEAGATE Hotel & Spa for special promo packages that are sure to pamper that special mom in your life. For assistance with all your vacation planning needs, contact the Palm Beach Tourism Office online or call (800) 554-7256.